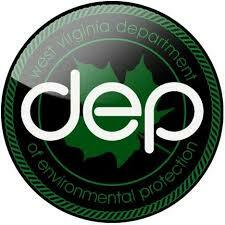 Thanks to everyone who submitted a request; the WVDEP has granted a public meeting on the air permit modification (permit R13-2896F) for Blue Racer Midstream, LLC’s Natrium Extraction and Fractionation Plant. The meeting is on Wednesday, March 27, 2019 at 6:00 PM at the New Martinsville City Hall, 191 Main Street, New Martinsville, WV. 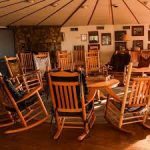 You will find at the bottom of the page a .pfd for the public meeting notification issued by the DEP with details on how you can submit written comments as well if you can’t make the meeting. 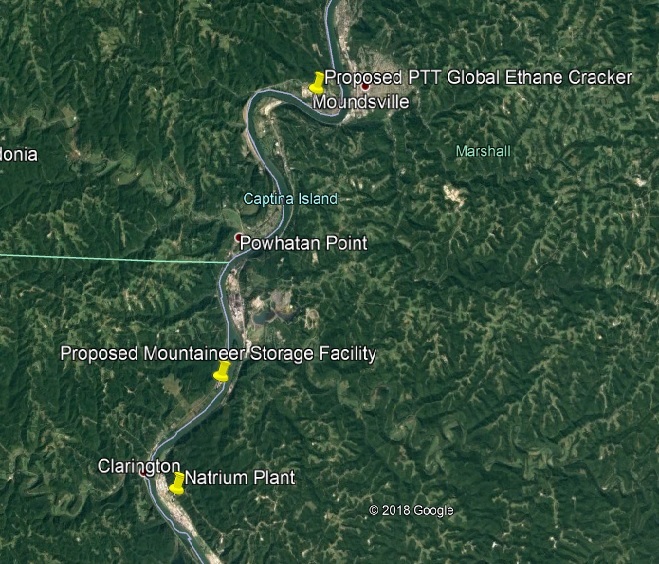 Map of the area long the Ohio River with the Natrium facility and the proposed PTT Global Ethane Cracker and Mountaineer Storage Facilities marked with yellow pins. Air patterns in this area move north along the river. The Natrium plant is a two-mile long facility that sits along the Ohio River about 12 miles south of the city of Moundsville, WV. A fractionation plant carries out one of the steps in refining natural gas liquids (NGLs) for use in petrochemical and plastics manufacturing. This plant likely would be processing ethane to be sent to the proposed PTT Global Ethane Cracker in Belmont County, OH, a stone’s throw north. Any excess ethane would be stored in the proposed Mountaineer Storage Facility, also nearby (see map at bottom of page). All are major infrastructure components for the proposed Appalachian Storage and Trading Hub/Petrochemical Complex. While the Natrium Plant has already been in operation for some time, it looks like they are applying for new permits to take on more NGL processing as part of the larger petrochemical hub. As a side note, Natrium does have on-site fracking pads too. This permit does not take into consideration the emission the PTT Global Ethane Cracker will also be contributing to this area (or any other industrial facility for that matter). States are not required to take into consideration the cumulative impacts of multiple facilities that work congruently. Nor do they take into consideration cumulative health impacts of long term exposure. Plus, the DEP fails to consider particulate matter less than 0.1 microns which have been demonstrated to have greater toxic effects on the human body. In 2016,the Natrium site leaked 17,000 gallons of chlorine gas that prompted the evacuation of hundreds of nearby residents and were cited for multiple safety violations. 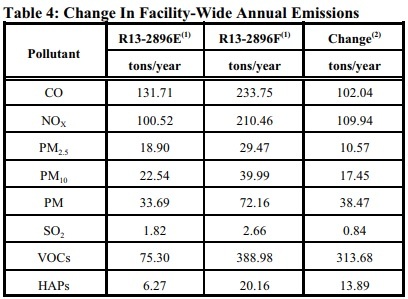 Table 4 (taken from the WVDEP’s Engineering Evaluation/Fact Sheet) shows the change in annual emissions in the air permit modification. Under this permit modification, Natrium is set to increase emissions of Carbon Monoxide (CO), Oxides of Nitrogen (NOx), Particulate Matter less than 2.5 microns (PM2.5), Particulate Matter less than 10 microns (PM10), Particulate Matter (PM), Sulfur Dioxide (SO2), Volatile Organic Compounds (VOC), and total Hazardous Air Pollutants (HAPs) which are carcinogens. Table 4 shows the changes between the current emissions and the permit modification. While at a glance, these number seem small, but keep in mind these limits are measured by Tons Per Year (TPY). You can click the names of the pollutants above for more information on how they impact human health. Do to the fact that air patterns along the Ohio River move in a northern direction, we are highly concerned about the cumulative impacts of air pollution form these proposed petrochemical facilities on communities in the area, especially Moundsville. Our region is also subject to air inversions. An inversion traps air pollution, such as smog, close to the ground making greater risk of exposure to human populations.